When you are new to rifle scopes, spending $500 or more on a rifle scope will not be the wisest move especially in this economy. Fortunately, with $200 or less you can easily get your hands on a good quality scope. In this article, I will be giving you tips on how to identify the best rifle scope under 200. This is in addition to reviewing the best rifle scopes under $200. Back in the day rifle scopes used to cost more than rifles. Today, thanks to advancements in technology cheap scopes can compete with their pricier counterparts. Nonetheless, when you are looking for the best rifle scope under 200, you must take caution. The budget rifle scope market is littered with low-quality scopes not worth your time and money. This is why it is important to do your homework before you go shopping for your next scope. Other top notch features makes it a great scope for deer hunting. N: B. If you are looking best scope for your 30-06 rilfe then consider this review https://outdoorever.com/best-scope-for-30-06/ it will be worth reading 🙂 Also there's another review about the best crossbow scope you can also follow the link. This refers to the amount of light a scope is able to transmit and how bright the images appear. Light transmission depends on the size of the objective lens. Every good quality scope needs to have excellent light transmission for all time use. Any good rifle scope that is worth its name should be tough enough to withstand different weather conditions. Thus, the best rifle scope under $200 should be durable and tough. Other features such as bullet drop compensator will improve the performance of a rifle scope. So which are the best rifle scopes under 200? Below are the reviews of six rifle scopes that I have personally used or tested and believe are the best in the under 200 price range category. First on my list is a rifle scope that I consider to be one of the best scopes for ar 15 under 200. And although I have never been a fan of fixed magnification rifle scope, I must admit this particular Nikon scope is of good quality. Its 3X fixed magnification is not deal breaker, especially, when you think of the generous field of view you get from this scope. To complement the fixed 3X magnification, Nikon equips this BDC scope with a 32 mm objective lens. And since it is a Nikon scope, it featured the tested and proven BDC reticle with a bullet drop compensator. But that not the only amazing features of this scope, at the top you get tactical turrets that turn without the need for tools. For a scope in its price point, I was surprised that this Nikon model has fully multicoated optics. The Nikon P-223 is designed for short range shooting. And since it comes with a bullet drop compensator it can be an ideal scope for hunting. In fact, I dare say it is the best hunting scope under 200 from Nikon. Vortex launched the Diamondback line of rifle scopes as a means of offering high-quality scopes at affordable prices. The Diamondback Dead-Hold BDC reticle scope offers a unique balance of affordability and quality. With a variable magnification of 4-12X, this scope has the kind of reticle you would expect in a high-end scope. To make things even more interesting, this scope has a large objective lens of 40 mm. The latter is responsible for the scope’s amazing light transmission. To give improve it already fantastic light transmission, Vortex equips this Diamondback with fully multicoated optics. 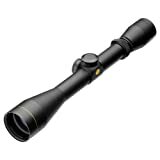 Similar to all other Diamondbacks, this scope is manufactured from high-quality aluminum. This means that not only is it lightweight, it is also durable and tough. As already mentioned, this Vortex Diamondback is ideal for long range shooting. This is especially thanks to its variable magnification as well as easy to use and fast focus eye piece. For all intents and purposes, it qualifies to be classified as the best rifle scope under 200 dollars in the Diamondback series. 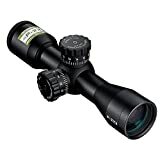 The Nikon P-223 3-9x40 mate BDC scope is the P223 3X 40 scope’s twin brother and offers everything that the fixed magnification version has to offer and more. Unlike its twin, this BDC scope has a variable magnification of 3-9X. And similar to its twin scope, this P-223 scope has fully multicoated optics and a fast focus eye piece. This combined with the 40 mm objective lens give the scope impressive light transmission and image brightness. Additionally, this scope has finger adjustable turrets that are easy to turn even when you are in the fields. One of the best things about this scope is that it comes with a 100-yard parallax setting, which means it eliminates parallax for precise shooting. Though the P-223 fixed magnification version is a great scope, I rather prefer its variable magnification twin, and for good reasons. The variable magnification version offers versatility and is durable. Additionally, it has a large objective lens. Thus, it is great for anyone looking for a scope for deer hunting. Considered to be an advanced version of the Leupold VX-I riflescope, the VX-1 3-9X40 Riflescope is not an entry level scope. And as such, it comes with a plethora of features unlikely to be found in the entry level segment. While measuring 12.6 inches long it is slightly longer than other scopes, it weighs 11 ounces, making it a manageable scope. As for the finish, you get to choose between a matte black and a glossy black finish. Personally, I prefer the matte black finish. The duplex reticle on this scope is designed to ensure minimal distractions in the target area. Therefore, you get a reticle that is precise and increases your chances of taking down a big buck. The inside of the scope’s tube is filled with nitrogen to make sure that water does not contaminate it. A multicoat 4 protection covers all the glass surfaces on this scope. With an eye relief of 4.2 inches, this scope is pleasant to use. While this scope does not have some of the features found in high-end scope’s it is still a great scope especially for beginners. With its multicoated glass surfaces and comfortable eye relief, this scope can qualify as one of the best deer hunting rifle scope under 200. The Bushnell Optics Drop Zone-223 riflescope has a rugged feel to it that I rather like. One of the best tactical scope under 200, this Bushnell creation has a lot to offer. To start with, the scope comes equipped with a BDC reticle that is specially calibrated for the 223 caliber bullet. The target turrets are also specially designed to be easy and effortless to turn. Despite its price tag, this scope features fully multicoated optics. In this regard, you get bright and super clear images. One of the unique things about this scope is that it is capable of long range shots thanks to its 3X to 9X variable magnification. On the other hand, the eye piece is designed to be easy to focus. The Bushnell Optics Drop Zone rifle scope is one of the best muzzleloader rifle scopes under 200, thanks to its special calibration. Additionally, there not many 3-9X scopes that can compete with this Bushnell creation at its price point. Therefore, this is the scope for target practice. Due to its weight, some may feel that it is a bit too much for hunting. The Crossfire line of scopes from Vortex has some of the best scope’s I have ever used, and the Vortex Crossfire II is no exception. With a rather low magnification of 2-7X, this scope has a great field of view of 42 feet at 100 yards. Similar to all other scope’s in the crossfire series, this scope is manufactured from aircraft grade aluminum. This means that not only is it tough and durable but is also lightweight. Fully multicoated optics give you a bright and clear optical experience. On the other hand, the V-Plex reticle on this scope is designed for a variety of hunting applications. Also, the resettable turrets are easy to use in the fields. Thanks to its long eye relief and wide field of view, this Vortex Crossfire is fit to be a hunting scope. It is thus one of the best rifle scopes under 200 dollars. In summary, this Crossfire is ideal for hunters of all kinds. Additionally, it can be a great replacement scope for a high-end scope. The budget scope market is littered with all kinds of scopes. While some are of good quality and get the job done, others can be a nightmare to use. Thus, you have to choose wisely when it comes to buying rifle scope’s in the under 200 budget segment. Furthermore, the scope you purchase should match its intended purpose. In conclusion, the above-reviewed scope’s can be a great addition to your collection or can be great as first-time scopes. Where To Shoot A Turkey With A Bow – Step By Step Easy Learning!! !